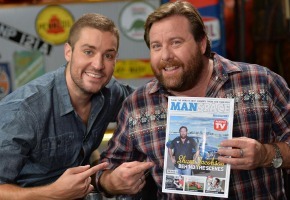 Shane Jacobson will co-host and co-executive produce a new show on GO! aimed at male viewers, tied in with men’s magazine, ManSpace. Promising to reveal “Australia’s most impressive man caves,” and “the complex mind of the modern male,” he will be joined by FOX FM presenter Dan Anstey. They will be joined former Block contestant Dale Vine, comedian Des Dowling, former AFL stars Brett Stephens and Michael Gale, aka “Moose and Butch”, and adventure man (and former Sale of the Century model) Murray Bingham. But multichannels may well be lifting their proportion of branded entertainment, as ways of attracting revenue. The ManSpace team has travelled the country to find Australia’s most impressive man caves and avid male collectors. The program, filmed in front of a live audience from a remarkable real man cave in Melbourne, also addresses men’s issues and special interests. Combining curiosity with larrikin humour, ManSpace examines what it means to be an Aussie bloke in the complicated, modern technological world. Produced by Silver Spoon Productions, led by Harvey Silver, with Jacobson as co-executive producer. 7:30pm Monday, May 26 on GO! Loving the show – watched again last night and loved the segment about keep men connected. A really important message and handled really well by Shane and the other panelists. Can not see this show going anywhere but out the door, what ratings did it get as it does not show in your ratings tab for May 26. Wow what a process just to make a comment. Why not list a repeat as such, with the nine network channels showing 3 shopping shows & 2 ancient movies..poor! Thanks Don. Registration for comments is pretty standard on the web via and email / password. It’s a one-off requirement and was introduced to help improve the standard of comments as well as giving me a point of contact if I need to check with you about your comment, thanks. Enjoyed the new show very much. But 15minutes in the presenter sair “Haitch” 3 times in a minute. Immediately changed channels. I bet they lost a lot just like me!!!! Wont be going back. Can’t wait for the show – if it’s as good as the magazine then it’s going to be great. I’ve been a subscriber since the first issue. Could be interesting but weird we haven’t heard about it until now since it’s on the air in a few weeks. Interesting..Nine programming a new local show against not only the Voice but also big guns House Rules and Masterchef. Might go OK though, completely different audience to the reality overload. Fair line-up of talent for a show on GO! How strange, something new on GO! What’s the bet it ignorantly gets labelled as sexist? I give it one week before it is replaced by repeats of TBBT. Good Lord – I hope they don’t try to have the entire cast on one episode.